The new McCovey Cove Loft is under construction in the right-field wall. The view looking out from the new McCovey Cove Loft in the right-field wall. The new 120-person Legends Club suite, under construction on the Club Level. The new McCovey’s Restaurant Catfish Po boy sandwich, available in the plaza behind the center-field scoreboard. New marinated Asian grilled chicken and vegetable wrap available at Edsel Ford Fong stands. Baby face, Giant heart — Tim is a gamer. 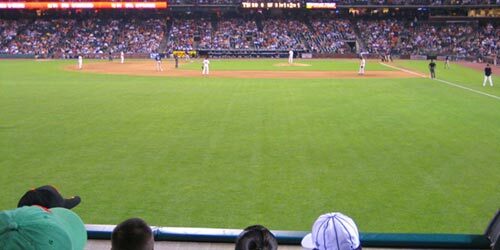 The Giants have hired Greg Elliott as their new head groundskeeper, only the second top turf man in the ballpark’s history after Scott MacVicar’s distinguished eight-year tenure. Elliott comes with impressive credentials, having been the South Atlantic League Groundskeeper of the Year four times for his work with the Lake County Captains. Twice he was named Sports Turf Manager of the Year for all of Class A baseball. He’s a graduate of Michigan State University’s Sports and Commercial Turfgrass Management Program and has worked for USA Baseball and the Arizona Fall League. * Spare turf is grown in the “sod farm” located directly behind the center-field wall. Scott once told me that other things, like tomato plants, have been grown in the sod farm. * The grass is a custom Kentucky Bluegrass blend, grown especially for the Giants in the Delta. * The Giants have never mowed any pattern into the field, per the wishes of managing general partner Peter Magowan. For the 2007 All-Star Game, a splashing-ball logo was painted into the grass and etched into the infield. * Contrary to some fans’ concerns, offseason events like football, concerts and motorcross don’t affect the field, since the turf is entirely replaced prior to the baseball season. For concerts and other on-field events during the season, a special flooring that prevents the grass from being crushed is used.